I have more than 30 years of experience and expertise in aesthetic implant and general dentistry. I am committed to providing the best possible results to each patient. My education, awards, and honors will give you the assurance that you are in very good hands. I earned a bachelor’s degree with high honors from East Central University. 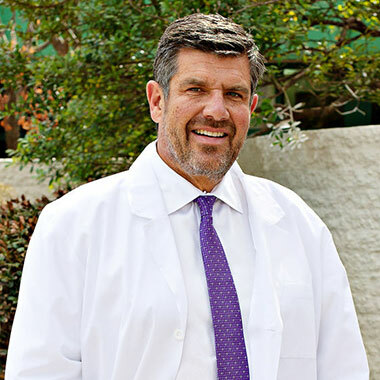 After graduating from the University of Oklahoma College of Dentistry in 1983, I spent two years as an associate in Ada with Dr. H. D. Hall, a nationally known implant dentist. This led to starting my own practice in Norman in 1985. I built and moved into the present location in 1990. My postgraduate training includes the L. D. Pankey Institute Continuum, LSU Cosmetic Continuum, and Misch International Implant Institute. I earned a fellowship with the prestigious International Congress of Oral Implantologists in 2002. Although I have trained in many other areas, these were the most intense and lengthy training I have received. The Pankey Institute gave me the ability to restore my patient’s mouth fully back to health. The Misch Institute gave me the ability to treat complex problems with implants and grafting. I also feel it is important to train our entire staff, so we have traveled to many continuting education events. My spiritual passion involves mission dentistry. This started in local clinics, including Health for Friends for many years. I was on the Health for Friends board and served as president. During this time, we ran an extraction clinic with OU pre-dental and dental students from OUCOD. In 1990, I joined other members of my church, McFarlin Memorial United Methodist, on my first foreign mission trip to Bolivia. My subsequent mission trips have included a return trip to Bolivia, as well as Costa Rica, Mexico, India, Guatemala, Liberia - West Africa, and Haiti. The work on these trips is especially difficult, but very rewarding, because the people are so grateful and the service improves their lives tremendously. In fall of 2009, I established an endowed and fully funded scholarship at Oklahoma University College of Dentistry for students who get involved in mission dentistry. I enjoy spending time with my family. My wife Kathy and I have been married since 1977. Kathy works in the Blum Dental office and is a certified Pilates instructor at Pilates Fitness Center of Norman. We enjoy working together and spending time traveling. We have a daughter, Katie, who lives in New York City and works for NBC’s Dateline. Katie also is president of the OU Alumni Association of New York City and is the youngest recepient of the University of Oklahoma’s Regents’ Alumni Award. I have loved watching Katie grow up while spending many years coaching her softball and basketball teams. We still enjoy attending sporting events together, including OU, Thunder, and her New York teams. My past hobbies have included flying as an instrument-rated pilot and scuba. Friday afternoons are reserved for a weekly round of golf. Our family has had many good times around these activities.